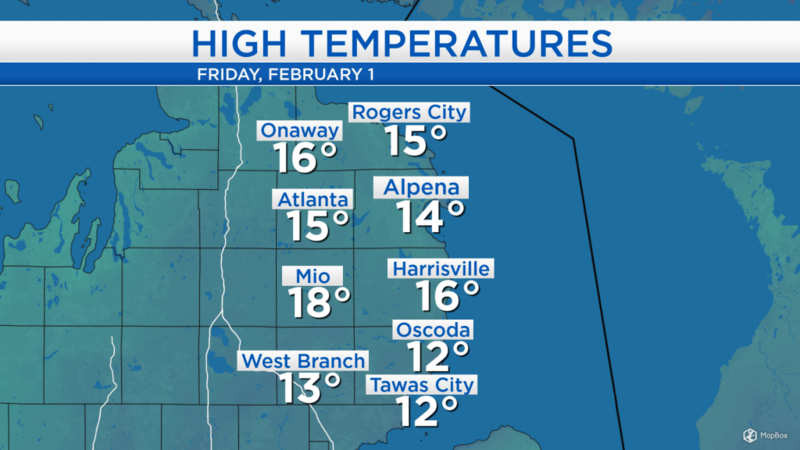 High temperatures today reached the mid-teens under some bright sunshine and a light breeze out of the southwest at 5-10 mph. Temperatures will continue to warm through the weekend. The northern part of our viewing area could see a few brief flurries tonight-early tomorrow. Saturday should end up mostly dry and warmer. Messy weather becomes increasingly likely on Sunday as a storm system develops over the Upper Plains. Throughout the month of January, the average of all the daily high temperatures was 24 degrees, slightly colder than normal. 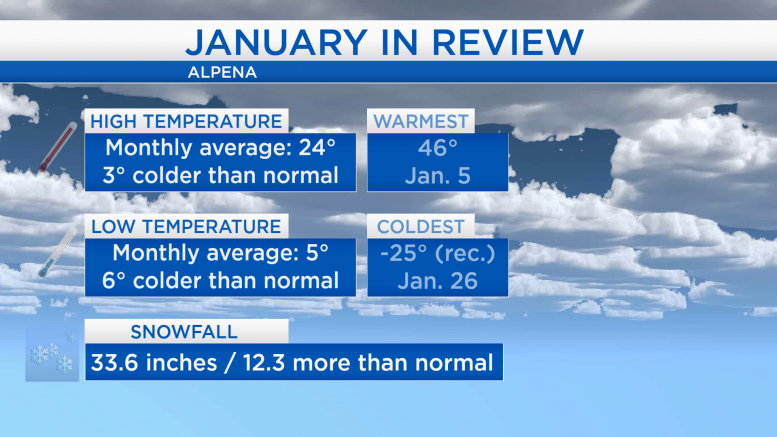 The average of all the low temperatures throughout the month was several degrees colder than normal, at 5 degrees. On January 26, a daily record low was set at -25 degrees. Snowfall piled up about a foot more than normal. Overnight lows will drop to around 8 degrees, then rise going into the morning hours. By the middle of tomorrow morning, temperatures will climb to the upper teens, then afternoon highs will reach around 30 degrees. 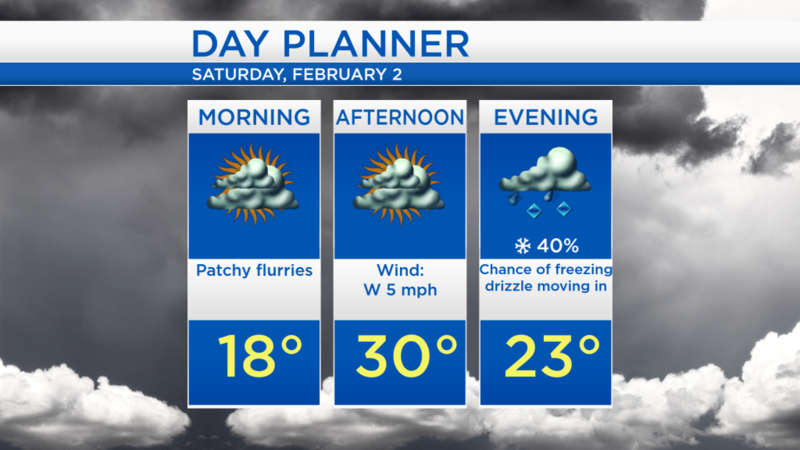 Overall, mostly cloudy skies are expected throughout the afternoon, then a chance of freezing drizzle (possibly mixed with snow showers) will move in tomorrow evening, creating slippery road surfaces. 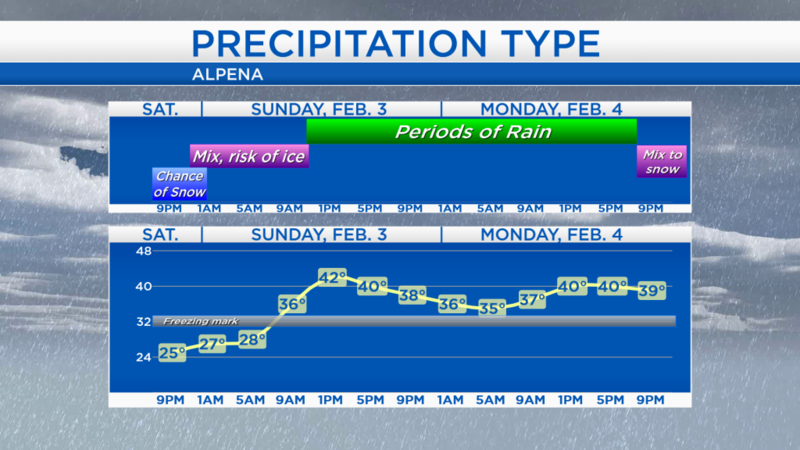 The chance of freezing drizzle will continue into Sunday morning, but ice-related issues will be short-lived as temperatures warm to the lower 40s, causing a changeover to rain. Some limited periods of dry weather may happen throughout Sunday, but periods of rain will continue on Monday. Highs will once again reach close to 40 degrees on Monday. Late Monday evening, a changeover to mixed precipitation or snow is possible as temperatures cool. Tomorrow (Groundhog Day) should end up mostly dry and milder than we have felt over the past few days. Freezing drizzle will change to rain on Sunday as temperatures warm above normal for early February. The warm and damp air mass will continue into Monday. Temperatures will drop to the lower 20s for afternoon highs on Tuesday. For the rest of Northeast Michigan’s weather forecast, watch the latest weather video by clicking the weather tab at the top of the page.